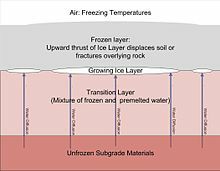 Frost heaving is the lifting of frozen soil, caused by water rising from below to the level in the soil where it freezes, accumulates as ice, and pushes the soil above it upwards. ↑ Taber, Stephen (1930). "The mechanics of frost heaving". Journal of Geology 38 (4): 303–317. doi:10.1086/623720. http://www.dtic.mil/cgi-bin/GetTRDoc?AD=ADA247424&Location=U2&doc=GetTRDoc.pdf. This page was last changed on 9 December 2017, at 08:14.